Why are social media marketing tools important? Social media marketing tools have become more valuable as the use of online social networks have exploded over the last decade. For many people social networks are one of their main sources of information and news. Millions of people share photos, messages and content every day on social media. Are social networks anything new? Humans have always been super social animals and we thrive best when connecting with other people. New ideas, products and behaviour spread through our social networks. Consequentially social media is just a visible extension of existing off-line social networks. However, social media can heavily influence both online and offline behaviour and social media signals are an important factor in SEO. Shares on social media can also create back links which help improve domain authority. Research by PriceWaterHouseCoopers (PWC) of over 20,000 consumers worldwide found that almost half (45%) of digital buyers indicated reading reviews, comments and feedback on social media influenced their digital shopping behaviour. The influence of social media is probably much greater than this for because many of our interactions happen offline via word of mouth and may be so subtle that they are very difficult to identify and measure. Indeed, research suggests that we often copy other people without being consciously aware of our behaviour. This is because we have developed an almost automatic ability to replicate the behaviour of those who we admire or aspire to be like. As a result the potential power of social networks should not be underestimated. The forecasts suggests that online social networks will continue to grow rapidly. To help you in this important area of marketing I have summarised below over 50 social media marketing tools that help improve your success in this area. A number of the social media marketing tools are free or have free trials available, so check them out if you think they could assist your social media planning and implementation. 1. 33Across: One of the most useful social media marketing tools which allows you to integrate analytics with your marketing efforts. 33Across offers traffic building and monetization tools for content publishers. SiteCTRL provides real-time insights on how people consumer and share your content. This includes Copy&Paste which monitors on-site copy and paste activity and auto-inserts the page URL to create organic back-links which improve search rankings. 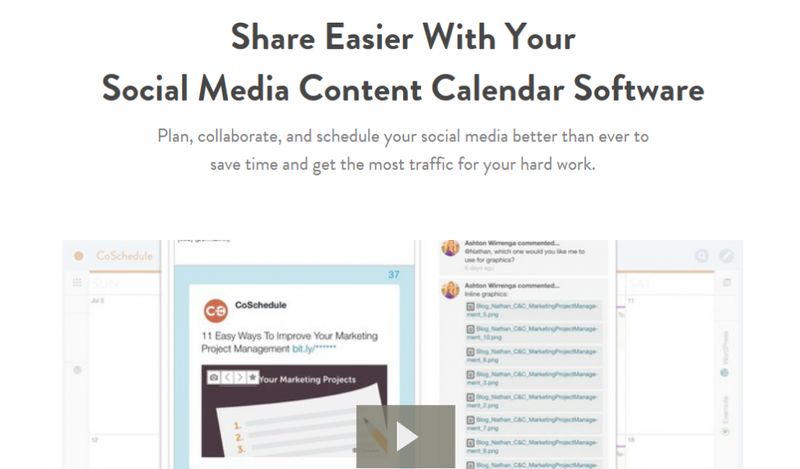 SpeedShare enables and tracks sharing of your content across multiple social networks. The analytics tool helps you to understand how your users share your content in the public domain and privately. RevCTRL generates insights into the best places where you should focus your marketing efforts and allows for better placement and more relevant ads for users. Select customized ad signals including social, search, contextual and more. As a result RevCTRL aims to provide higher CPMs and more revenue with fewer ads on your site. 2. Brandwatch: Supports 27 languages and is an ideal tool for international organisations that require a multi-language solution. It is able to monitor conversations across the vast majority of social networks and offers highly targeted searches with industry leading queries powered by 22 Boolean operators. Using an advanced algorithm it offers spam-free data from millions of online sources. 3. 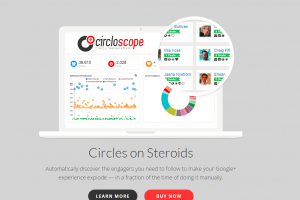 Circloscope: A circle management tool for Google+ It allows you to analyse a Google+ post and filter by the amount of engagement and then add those people who re-shared it to a circle. You can also drop in a link to an event and filter for attendees so that you can add them to a circle. 4. Crowdbooster: A social media strategy tool that gathers data from your Facebook and Twitter feeds. It allows you to analyse impressions, total reach and engagement and can inform you when people are most likely to view your latest blog post or video upload. This will help you adjust your strategy by understanding what is working and what is not. It also provides you with alerts about new Twitter members who may find your content or brand of interest. 5. Facebook Audience Insights: A Free tool from Facebook that allows you to better understand the audience you plan to target before you begin any campaigns. 6. Leadin App (from Hubspot): This is a Free inbound marketing tool which can tell you who is visiting your site and what content they are engaging with. When a visitor signs up to your site the app automatically identifies the social networks they are on and adds those details to their profile information. The app also allows you to set up contact and lead capture forms on your website, or synchronise your existing forms to your Leadin database. 7. LikeAlyzer: For Facebook growth this tool allows you to keep up-to-date with Facebook stats. LikeAlyzer weekly provides information on your Facebook page such as the number of posts per day, Likes, comments and shares per post, timing and length of posts. 8. Moz Analytics: One of the most highly rated social media marketing tools on the market. This provides you with a single dashboard to browse your social media performance and other marketing efforts. As Moz is an SEO tool as well it will show you how your social media activity is affecting your SEO standing. 9. 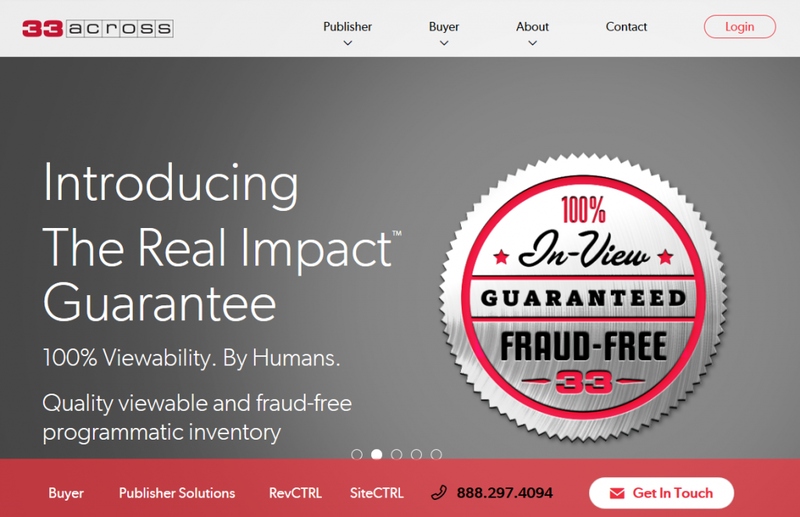 Qualia Media: The company has developed an Intent Quality Decision Engine to measure a person’s propensity to purchase. The engine identifies intent across screens and digital journeys by collecting and analysing signals of intent and selects your ideal consumers to deliver highly targeted ads. 10. Social Analytics: This is a Chrome extension that allows you to track real-time social engagement of any website to understand how popular a page or post is on various social networks. This helps you understand how content on a site is shared and where you might focus social engagement. 11. SocialFlow: Employs an optimisation algorithm that analyses your Twitter and Facebook data to ensure your content is sent at the optimum time. 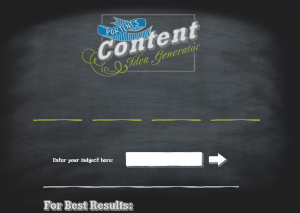 The tool uses three key criteria to determine when to post content. Message relevance, which of your messages in most likely to connect, your audience (who is currently online), and timing (when is the best moment to post this content). 12. Socialmention: A popular Free monitoring and listening tool. This covers over 100 social media networks and measures metrics such as sentiment, strength, passion and reach. Combined with an easy to use interface and the ability to export the data into an Excel sheet if required this is a highly useful tool that does not have any subscription to pay. A suite of social monitoring tools that help you collect and analyse relevant data within a framework that you can define to identify insights on what matters to you. It incorporates a workflow system that enables you to process large volumes of mentions to allow you to make data-driven decisions. 14. ubervu: Powered by Hootsuite, this is a popular real-time social media analytics tool that gives you access to primary data on social media activity which provides insights to improve your social media marketing activity. 1. Anews: An iOS app that allows you read all the news, blogs and social networks on topics that interest you in one place. 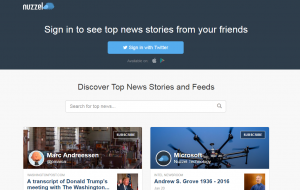 The app also enables you to share any articles with your social networks. 2. Atomicreach: This tool analyses the emotional appeal of your content and evaluates whether your articles are written appropriately for the kind of people that read your content. The app uses advanced data analytics to uncover how writing patterns impact your audience and machine learning to identify when they are interacting with your content. 3. EMV Headline Analzer: The Emotional Value Headline Analyzer is provided by the Advanced Marketing Institute for evaluating how emotional a headline is to provide an indication of the chances of it being shared. friends’ networks and your friends-of-friends’ networks. 5. 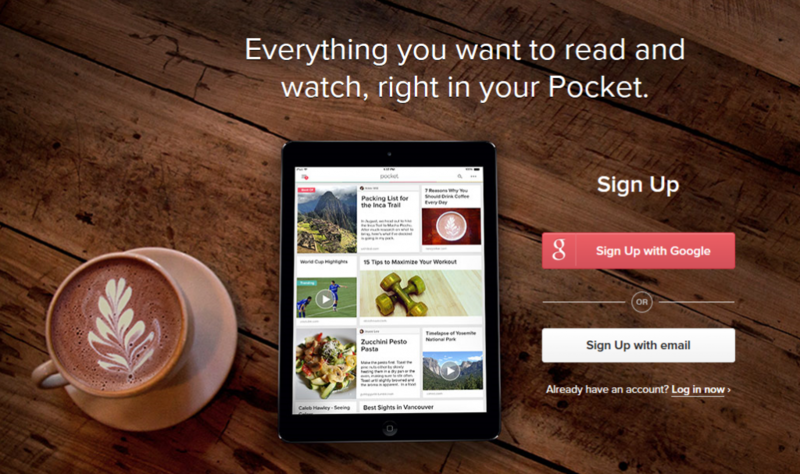 Pocket: One of the most popular social media marketing tools for content discovery and curation. This is a content curation tool that allows you to store articles, videos or other content for when you need it. It allows you to tag posts for easy sorting and filter by video, image or article. 6. Portent Idea Generator: If you ever need a bit of help with what to write about a certain subject this tool provides instant headline suggestions to build an article around. 7. RebelMouse: A social networking aggregation tool that allows you to use flexible, dynamic rules to auto-publish content from social platforms and gather content from RSS feeds and APIs. It also offers a CMS and mobile app platform which allows you to choose from a variety customisable designs. 8. 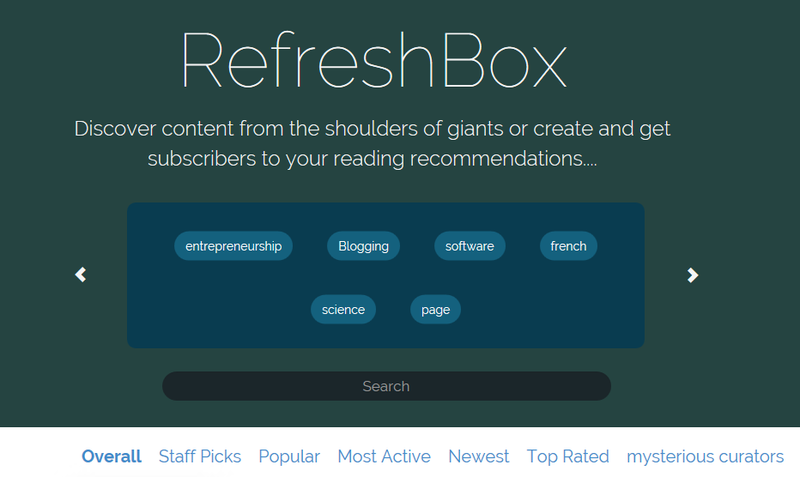 RefreshBox: Is a social curation and email marketing solution. The app allows you to package and send five links via email each week. There is a Chrome extension which will capture the title of any post you’re read and add it to your list which is automatically sent to your subscribers every Friday. 1. Buffer: Buffer has become one the most iconic of the social media marketing tools available. They offer a Free account manager for one Twitter, Facebook, Google+ and LinkedIn account with up to 10 updates in each of your buffers (account schedule). You can also have a 7 day trial to include Pinterest in your account. 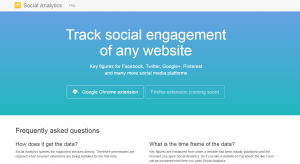 This a great tool to optimise and automate the times when you post on social media. Further, it provides detailed analytics of the number of clicks, favourites, shares, comments and the potential reach of individual posts. The browser plugin for the tool means that you don’t need to access the Buffer website to schedule or share content. backend of your WordPress website or blog. The tool will also monitor social media engagement from your posts and produce an activity report which ranks posts based upon the level of engagement. 3. eClincher: A comprehensive paid for social media management and publishing solution that starts from $15 a month. This includes automating publishing, engagement (live social fields), curating new content, post automation, social inbox, social monitoring, influencers, generate leads and social analytics. 4. 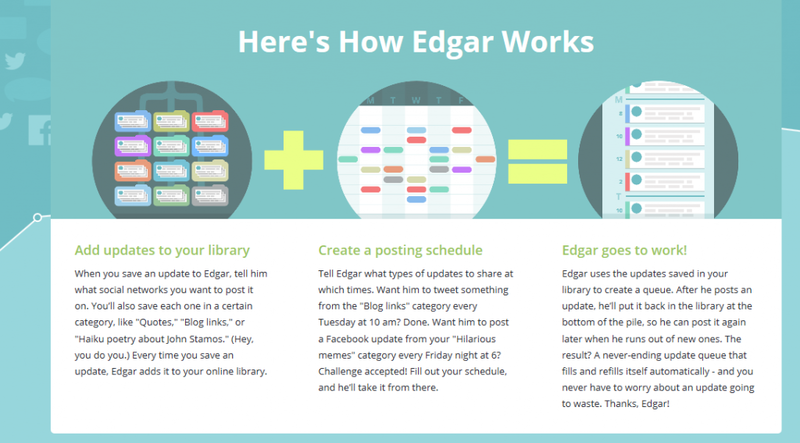 Edgar: A paid for solution that automatically adds your new posts to a library which allows you to recycle all your social media posts so that you end up with a never-ending queue of content. You can determine what to post and when it goes out. 5. Everypost: A Free social media app that allows you to manage all your posts onto the major social networks in one place. The app enables you to send updates simultaneously to Twitter, Facebook, LinkedIn, Google+, Tumblr, Pinterest and also allows you to post via email. For Twitter it has a text shortener that automatically shortens updates to keep them under 280 characters. 6. 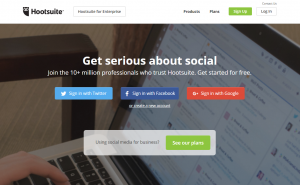 Hootsuite: This is one of the most well-known and popular social media marketing tools that helps you manage multiple social media accounts by monitoring, posting and delegating tasks within your team. This includes Twitter, Facebook, LinkedIn, Google+, WordPress, Foursquare, Instagram and many more. In addition Hootsuite offers customised analytics, including scheduled reports, and they have partnered with Brandwatch to further enhance analytical capabilities. Other features of the tool include the ability to collaborate as a team (e.g. delegate replies, Tweets, track messages etc. ), RSS integration (post updates from an RSS feed) and mobile apps. 7. IFTTT: This app allows you to connect many of your favourite apps to create automatic actions from one app to another when you complete a set task. These automated actions are called recipes and there are many to choose from. Recipes include Tweeting your Facebook updates, share your Instagrams to Facebook, forward emails to save attachments to Dropbox, posting Vimeo videos you like to Tumblr, saving new texts you receive in Google Spreadsheet, copying any Instagram pictures you take to Google Drive, adding your latest iPhone screenshots to a Dropbox folder and saving articles saved for later in Feedly in Pocket too. 8. Salesforce Marketing Cloud: The Digital Marketing Platform enables you to monitor and engage with customers across every channel, including email, social and mobile, automate and manage campaigns, publish content, analyse the results and optimize as you go. 9. 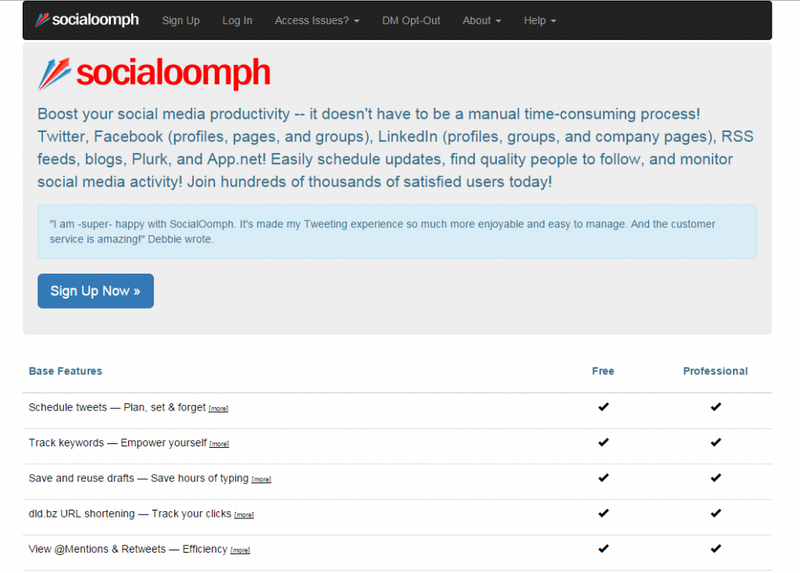 SocialOomph: This tool allows you to schedule tweets in advance and auto-follow your new followers. The dashboard enables you to combine Facebook, Twitter, LinkedIn, Plurk and your blog into one place to schedule posts and monitor social media activity. 10. 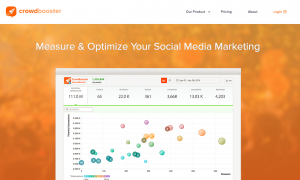 Spredfast: This is a social media management, listening, analytics, sponsorship and content marketing tool. It is particularly good for gathering data from Facebook, Twitter, YouTube and Flickr on audience reach and engagement. You can assess engagement and campaign performance with unified social media dashboards. It also includes a calendar feature which informs you of the optimal times to send updates. The tool integrates with digital analytics solutions such as Omniture, Google Analytics, Brandwatch, Crimson, Hexagon and more. 11. 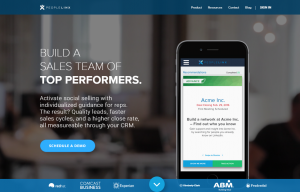 Sprout Social: A management and engagement platform for social business. You can manage, post, monitor, and analyse multiple social media accounts from the tool. It allows you to post updates simultaneously across Twitter, Facebook, Google+ and LinkedIn. publish content. Their analytics reporting allows you to customize social media reporting across networks and profiles. Offers a 30 day Free trail. 12. Tagboard: This is a social search and display platform which allows you to get a snap shot of sentiment surrounding your hashtag. This allows you to identify where most engagement was generated so that you prioritise effort in the right social networks. In addition Tagboard allows you to reply to people from the snapshot page, which works well for conferences and generating conversations in real-time. 13. Tailwind: An app for saving you time with managing your Pinterest account. It allows you to schedule pins in advance, schedule re-pins, easily pin any visual content from any website using the Tailwind hover button, obtain easy to understand analytics and get reminders about boards that you need to optimize. 1. 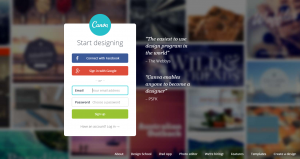 Canva: A free web-based design tool that has some of the best elements of Photoshop and a range of designer templates. A very easy to use tool which offers an excellent range of design templates, fonts and layouts. 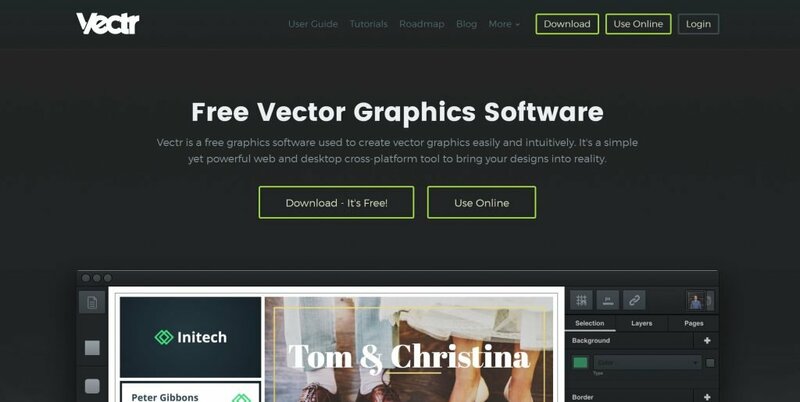 There are also free tutorials that show you how to produce better graphics. A great tool if you wish to customize images to post on social media. 2. Haiku Deck: A web-based and iPad app for creating awesome looking presentations and with the additional benefit of integrating with SlideShare. A great tool for reinventing content as you can choose from a range of stylish fonts, layouts and image filters to create a really polished looking presentation. 4. 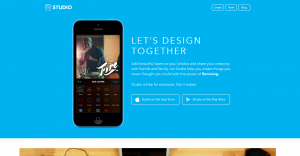 Markr: Is an app for creating visual hashtags for photos and videos. Connect your Facebook or Twitter account to capture trending hashtags or you can create your own hashtags, You can then add an appropriate hashtag directly to an image or video to help it stand out from the crowd. 5. Studio: A useful app that you can use with Instagram for image design. Studio is a photo-based social network that allows you to easily add text-based designs and layers to your photos. It also allows you to remix designs that you come across and share it as one of your own photos. 6. Vectr: This is a free and intuitive graphics editing app for web and desktop. Vectr has a low learning curve making graphic design accessible for everyone. 7. Word Swag: This is an iPhone app that allows you add awesome text effects to your photos to create professional-quality posts and photo-quotes. 1. Discover.ly: This is a Free Chrome extension that shows you the social networks that your email connections use and you can even cross-reference other social networks as you browse on individual social sites. This allows you to identify if you have the potential to connect with individual people across multiple social networks or how you might connect with someone new through a mutual connection. 2. Little Bird: A tool for identifying, targeting and engaging with the most influential people on the social web. It uses the collective discovery of other relevant people to find influencers and maps influencer networks to focus your social media strategy on the people that matter. 3. Zoho SalesIQ: This is platform for tracking website visitors that enables you to connect and engage with your users in real-time. It includes a language translator, integration with Zoho CRM and advanced triggers to segment visitors by how long they’ve been on your website, pages visited, type of visitor and many more classifications and responses. 1. Chase’s Calendar of Events: A platform that monitors events, holidays, landmarks, anniversaries, birthdays and many more items in the social calendar. The online calendar will plug you into the theme of the day and provide you with ideas for topical and interesting content or conversations. 2. Process Street: A free process and work flow management solution that also provides downloadable, step-by-step checklists for your articles to make your content more engaging. The tool also allows you to add images, videos and other files to your checklist. 3. Todoist: A useful tool to manage your daily task list. It also allows you capture ideas via mobile device, browser, email or desktop. You can then prioritise, schedule and add actions against each item on your list. It keeps individual project separate by using folders and labels and everyday it notifies you the day’s actions. enter an invite code and begin the recording. 2. Smart Podcast Player: A WordPress plugin for podcasters that is compatible with any podcast RSS feed from any podcasting hosting service, including Libsyn and SoundCloud. The design of the Smart Podcast Player allows you to display your podcast artwork, customise the colour of the adio track bar and adjust the colour of the full player between a light or dark coloured theme. 1. 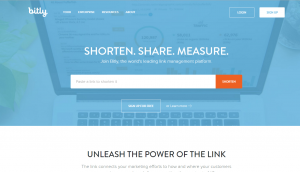 Bitly: A Free service that provides link shortening to post your content on social media accounts, together with real-time analytics, bookmarking your favourite sites and allows you to track clicks. 2. Snip.ly: This is one of the most well known social media marketing tools. This is an awesome URL link shortener that when clicked shows a customised call-to-action snippet at the bottom of the page. This is a fantastic way of driving traffic back to your own website by sharing great content from others. Snip.ly also has a Chrome browser plug-in that automatically snips links you share or create when used with Bit.ly. All your Bit.ly links will then automatically add the Snip.ly messages to your updates on social media. 3. SumoMe: This offers a suite of 11 free tools to help you grow the traffic to your site. The Scroll Box allows you to ask visitors to submit their email addresses as they finish reading your latest post or learning about your product. Smart Bar is positioned at the top of your website to remind your visitors to join your email list, read your latest blog post, or whatever else you want them to do. gamification Users are allocated to a team so that you can view activity across teams and at an individual level. It allows team managers to set up profile “optimizations” and “to-do’s” that get assigned to people in each team. Automated alerts are then sent to team members to take action. 1. Followerwonk: A great tool to analyse Twitter profiles. 30 day Free trial is available. 2. Tweepi: A useful tool for managing your Twitter account as it allows you to remove unfollowers, clean up inactive followers, reciprocate by following new followers and follow accounts that may be of interest. 3. Twitalyzer: A comprehensive Twitter analytics platform that combines basic Twitter measures with demographic data, commonly used metrics such as Klout, and their own proprietary scores. 4. Twitonomy: A dedicated Twitter account management and analytics tool that will give you insights on the people you follow and those that follow you. It allows you to see who you follow, but do not follow you back, and those that follow you, but you don’t follow. 1. 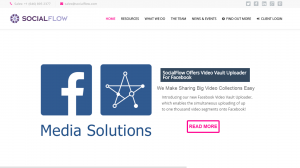 Overvideo: This is an iPhone app that creates visual calls to action when you share video content on Twitter, Facebook, Instagram and YouTube. The app allows you to create and customise the call to action or link in the video and you can even select the moment you want a graphic or message to display in the video. Wow, you have done fantastic to get to the end of this long post. If you have found my post useful please share using the social media icons on this page. Have you ever used recuweb.me to monitor your twitter campaigns?